Delhi chief minister Arvind Kejriwal ended his nine day sit-in at LG Anil Baijal’s office. Baijal wrote to the chief minister asking him to meet the IAS officers ‘urgently’ to address concerns of both sides through dialogue. Baijal’s letter is mainly in response to deputy chief minister Manish Sisodia’s request for a meeting between the Delhi government and bureaucrats to end the impasse. 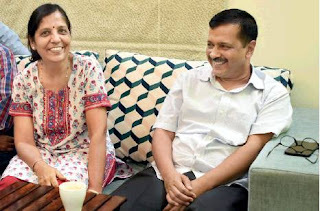 Kejriwal and Sisodia along with health minister Satyendar Jain and labour minister Gopal Rai began a sit-in at the LG office on June 11 demanding a direction to the IAS officers to end their ‘strike’. Kejriwal left Baijal’s office on Tuesday evening, accompanied by cabinet colleague Gopal Rai and AAP leaders Sanjay Singh and Raghav Chaddha. Announcing the end of Kejriwal’s fast, Sisodia, who was discharged from the hospital along with health minister Satyendra Jain on Tuesday morning, said meetings called by cabinet ministers Imran Hussain, Kailash Gahlot and Rajendra Gautam were duly attended by the IAS officers who had not been attending meetings earlier.